Move over Bethenny Frankel, Pauly D is rumored to be getting into the pre-mixed cocktail business. The Jersey Shore star is known for drinking and partying, so doesn’t it makes sense for Pauly D to have his own cocktail line? Keep reading to find out why Pauly D might strike it rich with this liquor deal. Pauly D will soon replace the laundry in GTL with liquor. The MTV star will no longer need to do his laundry, because he can pay someone to do it for him. 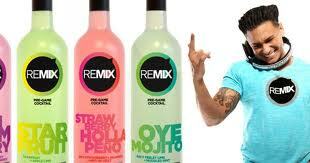 TMZ is reporting that Pauly D is launching a new line of pre-mixed alcoholic drinks called, REMIX. David Kanbar, the co-founder of Skinnygirl cocktails, is the person helping Pauly D venture into this vodka drink line. “The drink was brought to the Wine & Spirits Wholesalers of America convention in Las Vegas early last month and buyers loved it,” sources shared with TMZ. While the Skinnygirl brand is geared towards those who are concerned with healthy and natural ingredients, Pauly D is targeting a completely different segment. Pauly D is going after the partiers of course! REMIX will be geared toward the “pre-game” market. Yes, the drink you have before you go out drinking for the night.